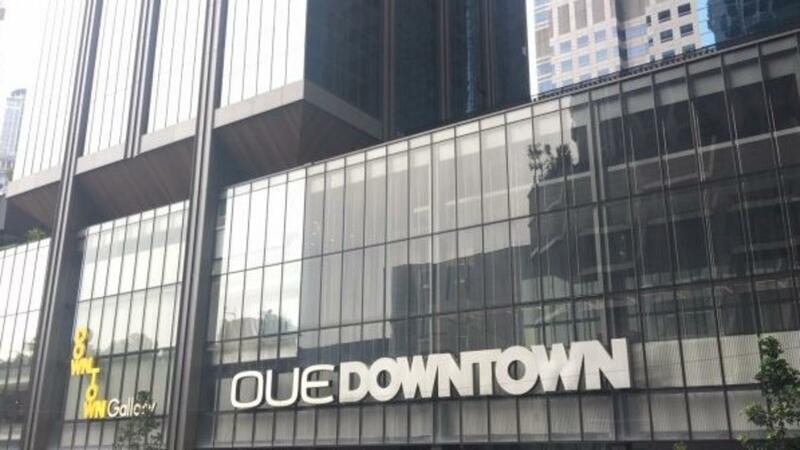 On 11th September 2018 (Tue), OUE Commercial REIT (OUE C-REIT) announced a proposed acquisition of the office components of OUE Downtown for S$908 million. In other words, 39.8% of the acquisition will be funded by borrowings while the remaining will be funded by shareholders funds. 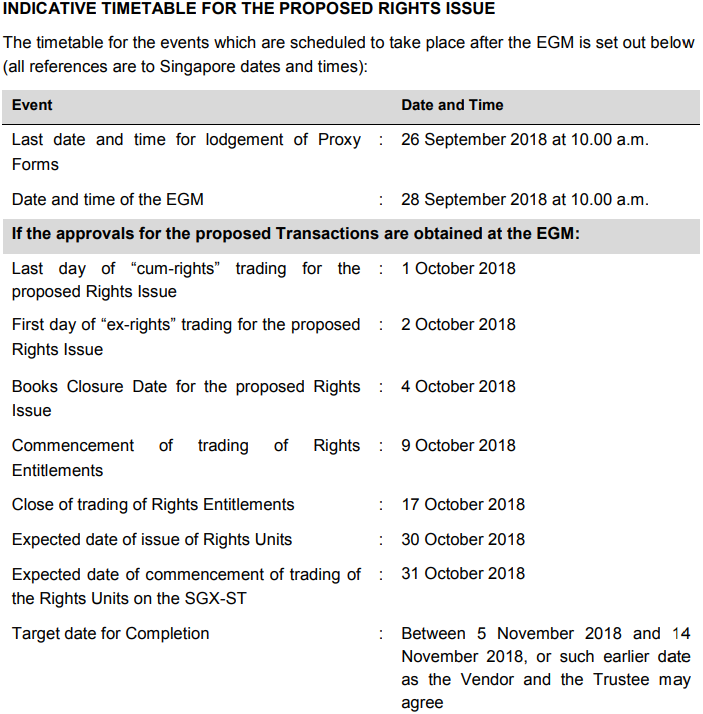 The rights are issued at S$0.456 per unit, a steep 31% discount from its latest trading price of S$0.660 per unit just before the announcement! At the point of writing, OUE C-REIT is currently trading at $0.600 per unit, falling 9.1% since the announcement. The acquisition is only for the office components of OUE Downtown. 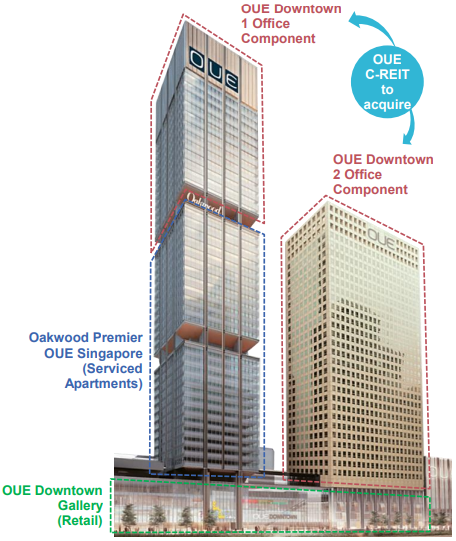 OUE Downtown is a mixed development consisting of Offices, Retail and Service Apartment Components. I can’t think of a situation why anyone would let the rights simply lapse without selling it (unless they didn’t know it’s tradable!) and at least get some cash value from it. According to the schedule, for those who do not which to exercise their rights, they have from 09-Oct to 17-Oct to trade their rights. For those wishing to buy into OUE C-REIT, perhaps purchasing these renounced rights and exercising it could provide and arbitrage opportunity and obtain the units cheap. Comparing the recent transactions, we can Freehold properties are transacting approximately $3,000 psf on the Net Lettable Area (NLA). Leasehold asset on the other hand transact around $2,500 psf with leases of more than 70 years (with the exception of Robinson 77 which was transacted at ~$1,800 psf). Therefore, the price paid for OUE Downtown seems somewhat fair. At first glance, it seems that the transaction seems sound with purchase consideration that seems comparable, fair and below the independent valuations. But on closer look, this acquisition may actually be destroying shareholder value. 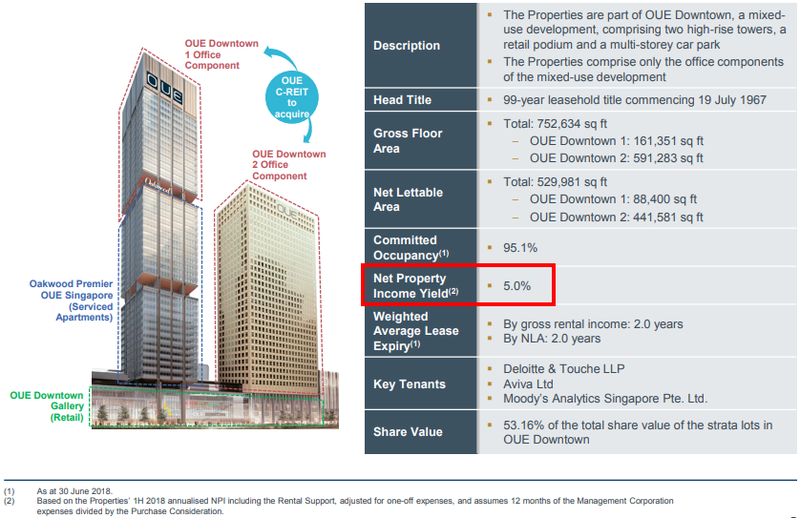 Why Is OUE C-REIT Buying When Everyone Else Is Selling? 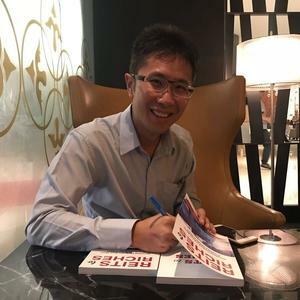 It would make sense to sell at this point and lock in some profits as the commercial office sector in Singapore has been on a rally. Based on the data from URA, it is clear that the Price Index, Rental Index and Median Rentals have been rising across the board since early-2017. It would seem strange that while its peers are deciding to sell into a rally, OUE C-REIT has instead chosen to acquire an asset during this time. Compelled to Acquire with Income Support? Based on OUE C-REITs 1H-2018 financial statements, its Net Property Income (NPI) came in at $69.2mil while its investment property portfolio (including subsidiaries) was valued at $3,533mil giving an NPI Yield of about 3.92%. Therefore, for the acquisition to be NPI accretive to the existing portfolio, it would need to provide a yield higher than 3.92%. Let’s work with the information above and try to estimate what the NPI yield would be without the income support. It seems management is viewing the property as “Premium” as it is providing a rental support at a base rent of $8.90 despite the independent report stating that comparable average rents are $8.4, approximately 5.6% above the average rents. As the management has given that the rental support price of $8.90 psf and the total NLA of 529,981 sqft with the yield property yield is 5.0%, we estimate that the gross rental is $56.6mil and then property expenses are $11.2mil. 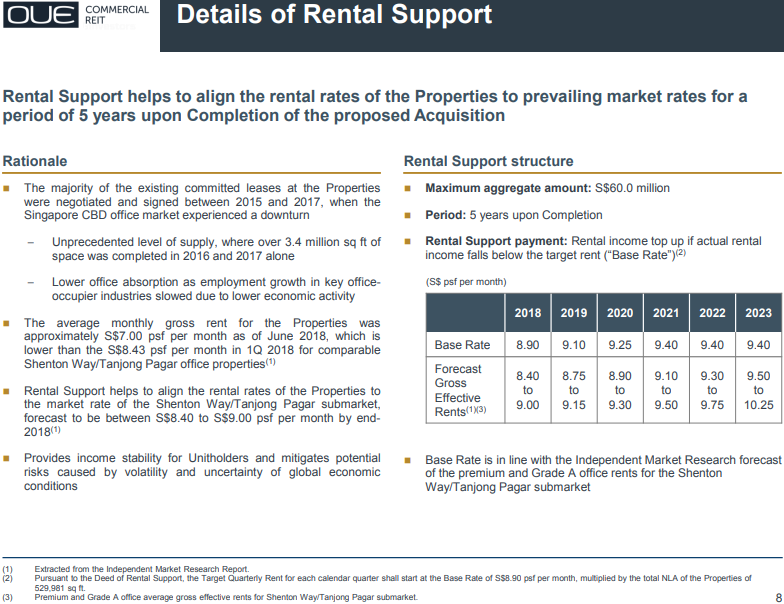 With this information, without the rental support and assuming the property expenses is $11.2mil as estimated above – the average rental price of $7.00 psf would mean that the property yield is only 3.67%. This is lower than the current portfolio yield of 3.92%. 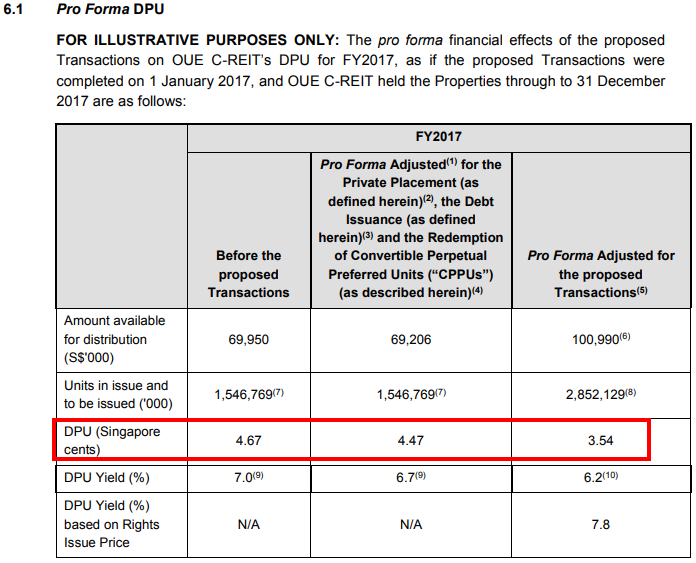 Similarly, at the average rental price of $8.43 psf, the property yield would be 4.67%. Based on the above estimate, it is quite possible that management was compelled to have to acquire with income support in order to boost the overall yield of the property to ensure the acquisition is NPI accretive. If management had instead purchased the asset during a time when the market values were lower, perhaps it may not have needed the income support and instead ride on the growth in rental prices? 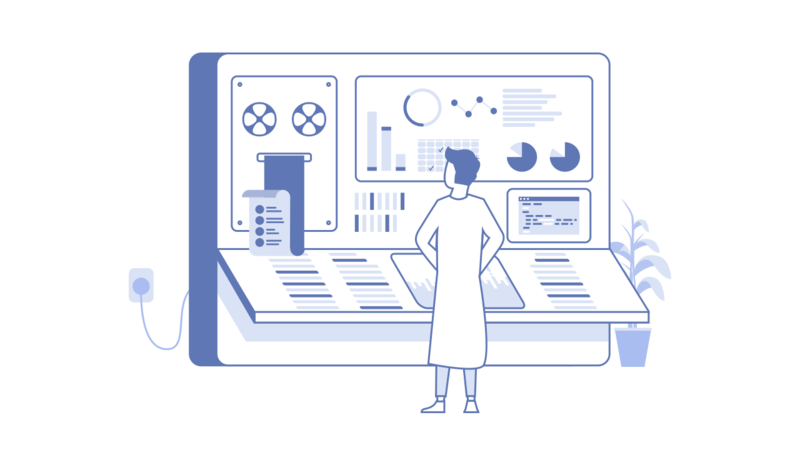 When issuing rights, the management and underwriter has to ensure that sufficient number of the rights are taken up in order to secure a sufficient amount of funds for its purpose. One method of making the rights issue attractive to ensure higher take up is to give a discount. OUE C-REIT is issuing an 83-for-every-100 existing units at a price of S$0.456 per unit, an extremely steep 31% discount from its latest trading price of S$0.660 per unit just before the announcement! According to the documents, the theoretical ex-rights price (TERP) after the 83% increase in units is S$0.570 per Unit. Therefore in theory, OUE C-REITs unit prices should gradually adjust to this price. Based on the announcement details, the pro forma DPU after the acquisition would result in a fall of a DPU from 4.67c to 3.54c! That’s a 24.2% fall in DPU. This means that regardless of whether a unitholder subscribe to the rights or not, they are simply worse-off after the acquisition! Consider a scenario of a unitholder who owns 10,000 units in OUE-C REIT. At 4.67c DPU, they would receive $467 in dividends. If they did not subscribe to the rights, they would be diluted and only receive $354 in dividends only. If they subscribe to the rights, they would have 18,300 units paying 3.54c DPU which means that they would receive $647.82 after forking out an additional $3,784.80. The incremental amount of dividend gained comes at 4.78% yield. To make matters worse, not only is the post-acquisition DPU lower, the post-acquisition NAV per Unit is also lower; falling from 91c to 70c only – a 23% fall in value for each share you own. After all that value destruction, the total gearing of OUE C-REIT is still high! A reduction of 40.3% to 39.8% is hardly an improvement to the gearing. As a result of this acquisition unitholders are left with lower DPU, lower NAV per Unit and a still elevated risk of high gearing. Using the figures available from the acquisition announcement, we tabulated the value and the post-acquisition valuation of the enlarged portfolio and compared the difference side-by-side. We would that this acquisition would result in a unit dilution of 83% but for only a 38.4% gain in NAV. 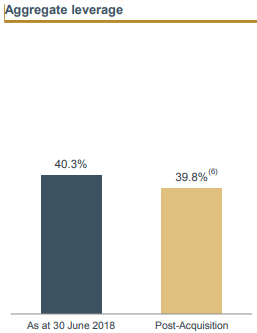 Both the NAV per Unit and DPU would fall by approximately 24%. As a result in the reduction of the DPU and NAV per Unit, unitholders are worse with the yield falling by 11.5% from 7.02% to 6.21% while the P/B Ratio increasing from 0.7259 to 0.8226. The gearing is also insignificantly lower as a result of the acquisition. One would wonder why any unitholder would agree to an acquisition that destroys both their value and distribution? We are not presently invested in this REIT, but if we were shareholders, we would certainly vote against this acquisition. This Acquisition a Done Deal? 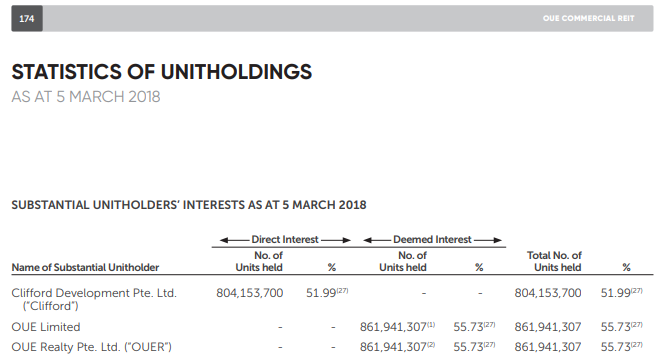 Base on the statistics of the unitholdings as of March 2018, OUE Ltd – the parent of OUE C-REIT already controls 55.73% of the holdings in the REIT and would certainly be influential during the voting process. Perhaps this deal is already done long before the EGM. Where does all these leave the minority unitholders whose value is being destroyed? What Is A Fair Price to Pay for Fraser Centrepoint Trust amidst Rising Interest Rates? 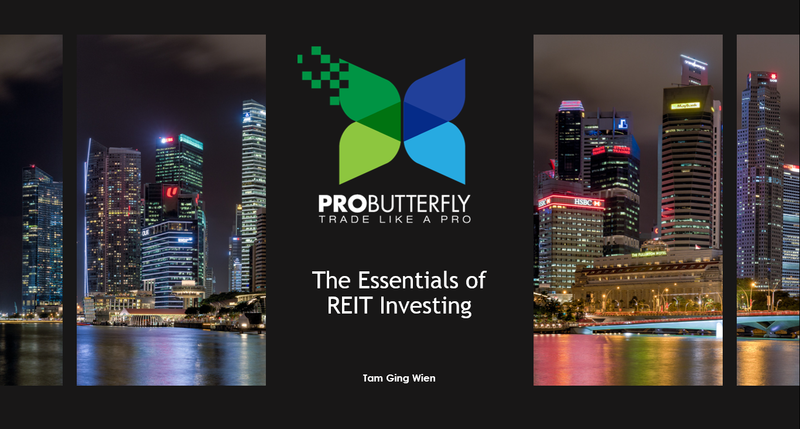 What Is A Fair Price to Pay for FirstREIT & PLifeREIT amidst Rising Interest Rates? What Is A Fair Price to Pay for Ascendas REIT amidst Rising Interest Rates?